A mom concerned over her paralyzed toddler’s ability to see the world decided to take matters into her own hands. Not content to wait until she was big enough to fit a standard wheelchair, she figured out a way to craft a tiny one so her daughter could explore like any other baby. Moral of the story? Leave it to a mom. It was back in August that we first told you about Kim Moore’s daughter, Evelyn. Eva, as her family calls her, was diagnosed at the age of 4 months with stage 4 neuroblastoma and was paralyzed by the cancer from the arms down. 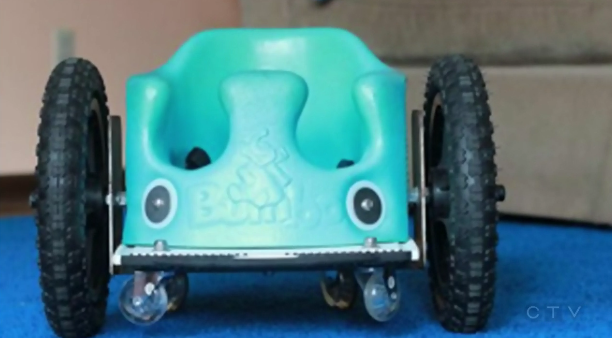 At 13 months, the infant was growing frustrated with her inability to get mobile, so her father created her a DIY wheelchair using Pinterest as their inspiration. Eva was diagnosed with stage 4 neuroblastoma at the age of 4 months. She underwent 8 rounds of chemotherapy but the tumor severed her spinal cord, leaving her paralyzed. 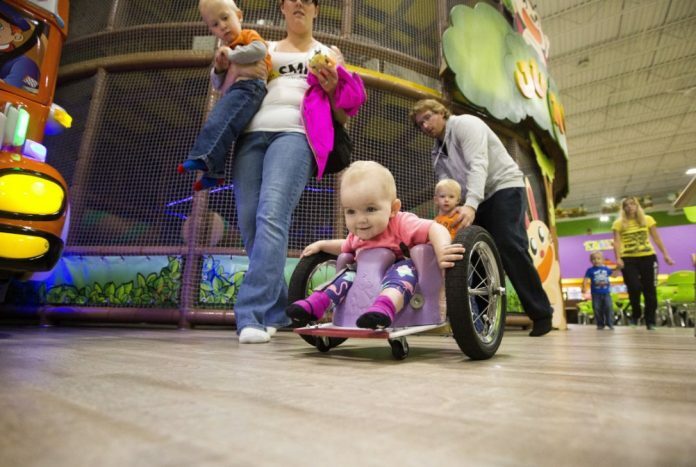 With doctors telling her parents she wouldn’t fit in a wheelchair until she was the age of 2, they improvised and created one for her using a Bumbo chair and a kitchen cutting board with castors and wheels attached to it. Her mother Kim Moore says the news was heartbreaking. “But then you go home and you cry and you come back the next day and be the strongest mom and dad you can ever be,” she told CTV news at the time. Not surprisingly, little Eva mastered her wheelchair in no time. After her husband Brad built the custom wheelchair for her daughter, Kim says it only took a little bit of time for her to get used to it. Now, at 18 months, little Eva is surpassing expectations again. In an interview with CBC Edmonton’s Radio Active show last week, the mother revealed that her daughter has actually taken her first steps! “The past few days we’ve seen Evelyn walk,” she explained. “It doesn’t look like two feet on the ground but it’s pretty beautiful. Eva is using a special standing frame made of steel and soft foam to help her with her efforts to stand and walk. It’s a full body brace that helps keep the toddler upright and supported. After Eva’s story went viral, her parents say they were overwhelmed by the outpouring of support they received. They also admit that they’ve struggled to figure out how to find the resources their daughter needs, and although they do receive subsidies to help with the special equipment, the majority of the donated money they’ve received is already been spent. Although it’s been hard for the Moore’s to watch their daughter struggle and deal with the cancer and the resulting paralysis, seeing her constantly improve and to actually take her first steps has been inspirational for the family. Tell us your thoughts in the comments and don’t forget to SHARE this post with your friends!